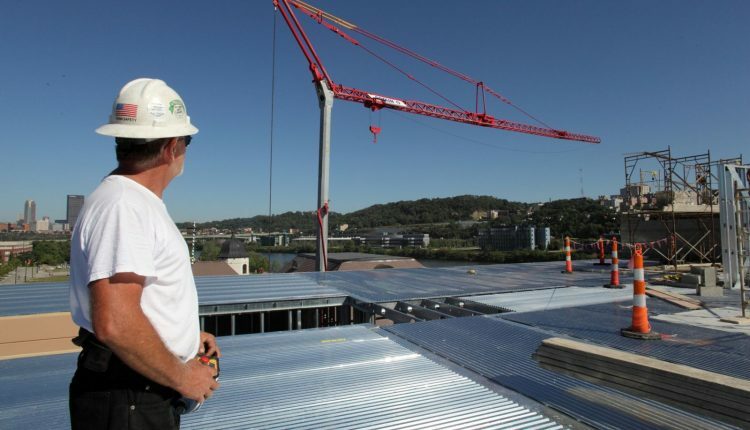 A contractor building a new Hyatt hotel in Pittsburgh, Pa., is finding that Potain self-erecting cranescan complete its construction work much faster and more securely than it once thought possible. Patrinos Painting & Contracting, a contractor based in Bethel Park, Pa., is using a Potain Igo 50 and a HDT 80 to construct the new Hyatt hotel in Pittsburgh. Bill Knerr, director of operations at Patrinos, says quickly completing the job would have been “virtually impossible” without the Potain tower cranes. The Potain cranes are lifting 653 structural metal stud and interior load bearing panels onto the seven-story structure, some weighing up to 2,500 pounds. The hotel is U-shaped, so Patrinos placed a Potain crane on two of its corners. The erection began in May and is expected to finish in August—much earlier than Patrinos had originally projected. Knerr says a similar job the company completed in Reading, Pa. took seven to 10 days longer to build each floor. He points to the remote control of the Igo 50 as one of the features helping to complete the work so quickly. The Igo 50 features a 4.4-ton lifting capacity and a 111-foot maximum hook height with the jib at 20 degrees. The HDT 80 has a 6.6-ton lifting capacity and 176-foot maximum hook height. The HDT 80 can also be controlled with a wireless remote control. The Igo 50’s small 14.8′ x 14.8′ footprint is also crucial to the job’s success. The new hotel is in a section of downtown Pittsburgh with limited space. The jobsite is flanked by a nearby restaurant, office building and the Monongahela River. The Igo 50 is placed only 3 ft from the property’s edge. Patrinos rented the two cranes from Indianola, Pa.-based American Contractors Equipment Company, a family-owned business with approximately 25 employees that’s been operating for more than 50 years. The company supplies cranes, boom trucks and other construction equipment to companies in Western Pennsylvania, Northern West Virginia and Eastern Ohio. It’s been renting Potain cranes for some five years. Chris Witte, an account executive at American Contractors, says the Potain cranes’ small footprints were perfect for the jobsite’s tight space requirements, and that their radio control boosted efficiency. Patrinos has been in business for more than 40 years and has approximately 200 employees. It’s worked on premier jobsites like the Penn Hills High School, Providence Point Assisted Living Residence and an expansion of Magee-Womens Hospital of UPMC. The general contractor on the job is Pittsburgh-based construction giant Rycon Construction. Erecting the new Hyatt hotel with the Potain cranes has been such a success, that Knerr considers the method a game changer. He envisions dormitories, group residences and other large buildings being constructed in the same manner as the new Hyatt, using Potain cranes to remotely fly in metal panels, and traditional wood-framed panels.